Black always stays on target. “The banks extorted FASB…” Oh, and they are really insolvent! "The Secret of Oz" won Best Documentary of 2010 at the Beloit International Film Festival. We beat out 6 other excellent finalists -- a really unbelievable win! Beloit, Wisconsin is about an hour from Chicago. It was a total shock to me. I was told that it had won about 15 minutes before the announcement so I had a chance to scribble a couple of thoughts on a piece of paper before I got to say a few words on stage. What a huge turnout Beloit has! This is the best film festival I've been to. These people are mad and they want to do something about it. Beloit has 18% unemployment right NOW! A Wisconsin State Senator came up after the presentation and asked how the State Bank idea would work -- specifically what they would do about the existing debt. Freedom’s Vision would first work to repair the balance sheets of individuals by cleansing out much of the overabundant consumer credit. That means they have disposable income again and business starts to pick up immediately. Banks begin to get healthy immediately and then go through a debt and derivative clearing process. State Chartered Banks are created that give access to lower cost capital and Freedom’s Vision contains provisions to cleanse out a portion of the current debt that states carry. i. 50% of those funds will pay down current state debts easing the state’s debt burden. a. All state tax monies are deposited in this bank. b. 10 to 1 fractional reserve maximum on DEPOSITS which are backed by taxing authority and by vast assets, making these banks some of the most sound banks in the world – would exceed all other banking requirements. c. Banks will support other commercial banks within state. d. Banks will provide low or no interest loans to state for infrastructure projects. e. The bank would generally support private people only by providing capital and working with private banks. These banks will meet or exceed all other banking requirements and be limited in a very conservative manner. f. The advantage to the state is that they can get low or no interest loans and they can earn interest that goes to the people of the state instead of the central bank. These banks would generally be prohibited from lending directly to the public, but could perform a regional banking function supporting and regulating local banks much as the regional reserve banks do now. iii. In addition to the above funds, State governments will be given initial funding from the Treasury to create a reserve fund equal to 10% of their annual budget. This money will be deposited and held in the State bank as the state’s reserve fund. Each state must develop a plan under which such funds can or cannot be used. Their plan MUST include a strategy to replenish the fund without federal aid and without raising new taxes for that purpose. Shrinking the size of government or saving from current taxes is the only method allowed to rebuild the fund once any of these funds are spent. Thus there will be no new taxes allowed in any form if funds are used from the reserve until the funds are returned. Governments need procedures to get them to size themselves for the bottom of economic cycles, not the top. This is the same thing that happens to businesses, and why conservative companies survive economic downturns and overly aggressive ones do not. 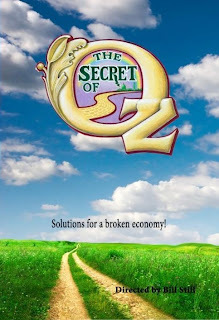 You can get your copy of the Secret of Oz by following the link below. *Please note that if you are a blogger or media representative then you can receive a complimentary media screening copy by request to nmartin@swarmusa.com. Mr. Still has also made available copies for veterans and for those who are in legitimate financial distress – again, please contact nmartin@swarmusa.com. 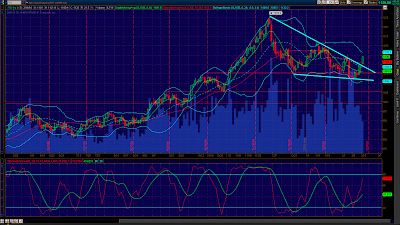 The dollar broke out above overhead resistance and is significantly higher, now above the 81 mark. Bonds moved upwards slightly, actually slightly lower in yield, oil which was down hard is now back higher again, and gold is down but not as much as it was. NEW YORK (Fortune) -- The Federal Reserve raised the rate it charges banks that borrow from the central bank when they run short of funds. The Fed said late Thursday it is raising its discount rate by a quarter percentage point, or 25 basis points, to 0.75%. The central bank said in a statement it made the move in response to improving financial market conditions. The move is largely symbolic, because banks do little borrowing at the discount window. The unanimous decision to boost the discount rate also has no effect on the more widely watched federal funds rate, which measures the rate banks charge each other for overnight loans. That rate is expected to remain between 0% and 0.25% for the foreseeable future, given the slack in the labor market and the still fragile state of the economy. But raising the discount rate allows Federal Reserve chairman Ben Bernanke to take another small step toward normal monetary policy, after the past two-plus years were consumed in a financial firefight. "The modifications are not expected to lead to tighter financial conditions for households and businesses and do not signal any change in the outlook for the economy or for monetary policy," the Fed said in a statement. The Fed also shortened the term of some discount window loans and raised the minimum bid in the term auction facilities it uses to supply overnight funds to banks. Those facilities were among the many innovations Bernanke introduced since the onset of the credit crunch in mid-2007 to supply U.S. banks with funding. Bernanke has emphasized that the Fed will use multiple new tools to prevent the excess reserves from fueling inflation, including the payment of interest on reserves at the Fed and the sale of Fed assets. Paying interest on “excess reserves” is nothing but another crime against America, that one REALLY bothers me every time I see it. Remember, rising rates generally means lower prices for bonds. If this is the start of a tightening cycle, it has come earlier than most expected and it played like a knee-jerk reaction to the hot PPI numbers yesterday. I was expecting today’s CPI to be hot too thinking that they knew something about it, but it actually came in a little lower than expected but still warm enough, for sure. Higher gasoline prices slammed consumer wallets in January but a drop in shelter costs kept both the headline and core rate softer than expected. Headline consumer price inflation in January held steady at a 0.2 percent increase-matching December's revised pace (new seasonal factors). The headline number for January was a little below market expectation for a 0.3 percent boost. Core CPI inflation actually fell at a 0.1 percent monthly rate, following a 0.1 percent uptick in December. The consensus had forecast a 0.1 percent rise for the core CPI. The gain in the headline CPI was due largely to higher gasoline prices. The core was pulled down by a 2.1 percent drop in lodging while away from home and by a 0.1 percent dip in owners' equivalent rent. Basically, hotels and resorts are still trying to lure customers with discounts. And rents are soft for housing in markets, caused by high unemployment. In the latest month, energy was up sharply while food price inflation firmed moderately. Energy spiked 2.8 percent after a 0.8 percent increase in December. Gasoline surged 4.4 percent after increasing 2.3 percent in December. Food inflation in January firmed to 0.2 percent from a 0.1 percent uptick the month before. Year-on-year, overall CPI inflation slipped to 2.7 percent (seasonally adjusted) from 2.8 percent in December. The core rate was declined in January to 1.5 percent from 1.8 percent the month before. On an unadjusted year-ago basis, the headline number was up 2.6 percent in January while the core was up 1.6 percent. We got a very different report on the CPI, compared to yesterday's inflation scary PPI report. The CPI report is much softer. 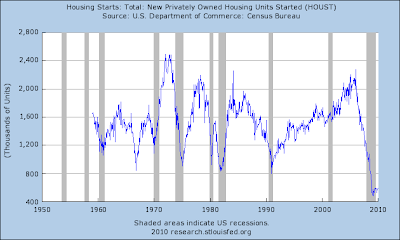 The CPI housing component made most of the difference. But other components outside of energy are subdued. The report should be good for bonds but markets are still reacting to yesterday's after-close announcement by the Fed of an increase in the discount rate. Equity futures are still down from that announcement. The year over year CPI was up 2.7%. Keep in mind that the PPI is on the producer level and leads the CPI. We’ll have to watch the flow of money between asset classes closely now. 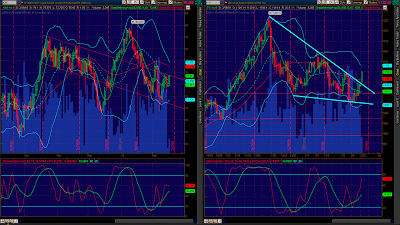 Bonds are getting to an important juncture at their long term trendlines and large H&S necklines. 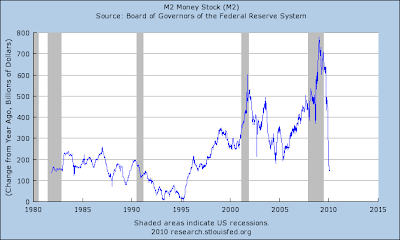 It is a fallacy that rising rates causes stocks to go down. It will flatten the yield curve and make earning money on the spread more difficult, but it can also drive money away from bonds as the price falls, a complicated dynamic that has to be watched closely. A break of the necklines on those patterns would be very dangerous for all holders of debt (everyone). Speaking of people with debt, we continue to throw water on drowning people by trying to give them more or different “credit” and by trying to force the price of housing higher. I can tell you that housing is still nuts, as in way too expensive compared to incomes and rents. NEW YORK (CNNMoney.com) -- Under pressure to do more for troubled homeowners, President Obama is expected to announce on Friday a $1.5 billion program to help borrowers in the five states hit hardest by the housing crisis. The initiative calls for pumping money into state housing agencies in California, Arizona, Nevada, Florida and Michigan to fund programs to prevent foreclosure for people who are unemployed or who owe more than their homes are worth. Also, the agencies can assist homeowners having trouble securing loan modifications because of second liens, as well as promote affordable housing opportunities. Obama is scheduled to unveil the initiative, which will be funded with money from the TARP bank bailout, at events in Nevada, which has the highest number of underwater homeowners at 65% and the nation's second-highest unemployment rate at 13%. The president will be joined by Senate Majority Leader Harry Reid, D-Nev., who is facing a tough reelection campaign. The funds will be allocated based on a formula that takes into account home price declines and unemployment. The agencies' programs must be approved by the Treasury Department. The move is the administration's latest attempt to fix its signature foreclosure-prevention effort, the Home Affordable Modification Program, which has been widely panned for not doing enough. Just another politically inspired Band-Aid and attempt to manipulate prices by our government, the real beneficiaries will once again be the banks. This is also a recycling of TARP funds, a tactic that is on questionable legal grounds in my opinion. NEW YORK (CNNMoney.com) -- Just as they are contending with massive gaps in their operating budgets, states and localities must also deal with a $1 trillion deficit in public employees' retirement benefits' funds, a new report found. The shortfall amounts to more than $8,800 for every household in the nation, according to the Pew Center on the States, which published its findings Thursday. States largely got themselves into this mess by failing to make annual contributions while also enhancing benefits, the study found. Now, they are behind by a total $452 billion in their pension accounts and $555 billion in their retiree health funds, as of the end of fiscal 2008, which ended June 30 for most states. The deficit is likely even more severe because the report did not take into account the crumbling of the stock market in the latter half of 2008. The typical pension plan lost 25% of its value in 2008. States must find ways to make up these gaps because retiree benefits for public workers are largely guaranteed by union contract. And they are funded through contributions from both employees and state employers, as well as investment returns. So when gaps appear, states must ask their residents to make up the difference, usually through property tax or income tax hikes. "Ultimately, taxpayers could face higher taxes and cuts in services," said Stephen Fehr, one of the report's authors. "You can't ignore the problem. It's just going to be more serious budget trouble for states down the road." To be sure, the bill isn't due all at once and no state is in danger of default. These benefits are paid out over decades. Still, the deficits must be addressed sooner than later or the gaps will simply balloon more. The consequences of the shortfall could be severe. It comes at a time when states are wrestling with a cumulative $180 billion budget gap for fiscal 2011. Eight states are in the most dire shape, according to the Pew report. These include: Alaska, Colorado, Illinois, Kansas, Kentucky, Maryland, New Jersey and Oklahoma. Two of these states -- Illinois and Kansas -- have less than 60% of the necessary assets on hand to meet their long-term pension obligations. Only four states -- Florida, New York, Washington and Wisconsin -- had a fully funded system in 2008, down from just over half at the beginning of the decade. What’s there to say about this? I am certain that the actual shortfall is much larger and will be much larger in the future. Where is the money going to come from? States are buried in debt and revenue shortfalls. It takes income to service debt and the income is not there. Markets by trailing P/E are priced the highest they have ever been in history, what happens to these funds as that situation corrects and returns to historic standards? No, don’t believe the forward looking or “operating earnings” bull, that will not pan out as it didn’t for Dell earnings in the 4th quarter as reported yesterday (they are down about 5% this morning). While this may not be popular, I want to talk about this guy that flew his plane into the Austin IRS center. Of course performing an act like that is “nuts” in that anyone who commits suicide or an act of violence against others is obviously not in a good frame of mind, for sure. But desperate people do desperate things. Back any animal into a corner without escape and they will eventually lash out. 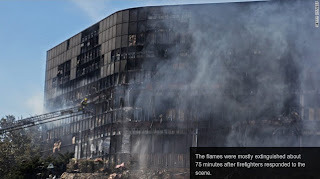 Why are government buildings being targeted in such attacks? Perhaps we should read and heed his dying words, what the media calls his “manifesto.” Oh yes, his “manifesto” is insane, but hey, I think there’s a message here that should not be ignored. I would like to point out that if we continue down the debt backed mathematically impossible path that we are headed, that events like this will only become more common unless the ones who are truly nuts, the ones who are the pushers and purveyors of debt are the ones who become marginalized as they deserve. Again, without focusing on the root cause, we are destined to see more of this. Freedom’s Vision gets to the root of these problems by taking the pressure off government to be in a state of never ending growth with debt and therefore a panic to collect more debt backed money that doesn’t belong to them in the first place. The dollar is higher, bonds are higher, both oil and gold are lower. Let’s start over at the world’s largest retailer, Wal-Mart, where they missed earnings estimates for the fourth quarter. Gee, that’s different. Sales, measured in dollars, were down 1.6% year over year. Again, that’s measured in dollars, what would they be if measured in actual goods? And that’s with all sorts of competitors going out of business over that timeframe, so what does that tell you about overall sales? It tells me to keep looking at sales tax receipts and keep ignoring all the other manipulated data. Stocks and commodities dropped in immediate reaction to a much larger-than-expected level of jobless claims, at 473,000 in the Feb. 13 week vs. expectations for 440,000. There's important special factors possibly affecting the data but their effects are unknown and the Labor Department isn't offering any explanations. There was extremely heavy weather through most of the nation in the reporting week, and results from four states had to be estimated including the key states of Texas and California with holiday backlog in the latter having skewed prior reports. Turning to the four-week average points to steady conditions in the labor market. The average fell 1,500 to 467,500, a level roughly in line with the last four weeks and in line with readings in late December. Other data in the report include no change for continuing claims, at 4.563 million, and no change in the unemployment rate for insured workers, at 3.5 percent. Wait and see is the best approach to judge jobless claims. The weather effect may yet appear, having produced perhaps another backlog due to the closure of claims offices. The outlook for the jobs report in February is open which will put the emphasis on private forecasts especially ADP's tally. Markets are stable at slightly lower levels. LOL, there are special factors possibly affecting the data but the Labor Department isn’t talking. Niiiiccce. Did that come from the DOL or from Econoday? Well, no mention of special factors in the DOL’s report, but if they are talking about weather and the snow storms on the east coast, wouldn’t that keep the number of claims lower, not higher? I mean maybe people who are layed off can make it into the unemployment office to file a claim but they can't make it into work, is that the way it works? States reported 5,797,875 persons claiming EUC (Emergency Unemployment Compensation) benefits for the week ending Jan. 30, an increase of 304,748 from the prior week. There were 1,903,779 claimants in the comparable week in 2009. EUC weekly claims include first, second, third, and fourth tier activity. AN INCREASE OF 304,748 FROM THE PRIOR WEEK! Holly cow! Where are all these new jobs the administration keeps talking about? Where is the turn around in employment? What is so dang hard to understand about DEBT SATURATION? And remember, our population keeps growing. We need to MAKE a ton of jobs just to stay even. Higher energy costs in January jacked up the headline but the core rate also heated up a bit. The overall PPI jumped 1.4 percent after rising 0.4 percent in December. The January surge came in much higher than the market forecast for a spike of 0.8 percent. At the core level, the PPI increased to a 0.3 percent gain after a flat reading in December. The consensus had projected a 0.1 percent rise. The headline increase was led by a 5.1 percent surge in energy costs with gasoline up 11.5 percent. Food costs also were up notably, gaining 0.4 but down from 1.3 percent in December. For the latest month, the core was led by light motor trucks which rose 1.9 percent and by pharmaceutical preparations which jumped 1.3 percent. PPI numbers have been quite volatile recently. The latest headline is quite strong but you only have to go back to November for a number that topped it with a 1.5 percent spike. The same holds true for the core. The January jump of 0.3 percent is the largest since only November which saw a 0.5 percent surge. For the overall PPI, the year-on-year rate increased to 5.0 percent from 4.7 percent in December (seasonally adjusted). The core rate year-ago pace firmed to 1.0 percent from 0.9 percent the prior month. On a not seasonally adjusted basis for January, the year-ago increase for the headline PPI was up 4.6 percent while the core was up 1.0 percent. Today's report indicates that there are pockets of inflation despite the sluggish recovery. But if economic growth remains soft and if the Fed does unwind its balance sheet expansion in a timely manner, the pockets of inflation likely will not spread. But those are big ifs. Markets are ignoring the PPI release for the most part as initial jobless claims jumped in a report released at the same time. Also, the energy based jump apparently is being discounted as not continuing. Treasury yields edged down on the release of the PPI and jobless claims as equity futures eased and the dollar firmed. Month to month up 1.4% and year over year up 5%! Yowzaaa, that type of math doesn’t give our system very much longer at all. The bigger these numbers get, the shorter the time our monetary system has, that’s all there is to it. 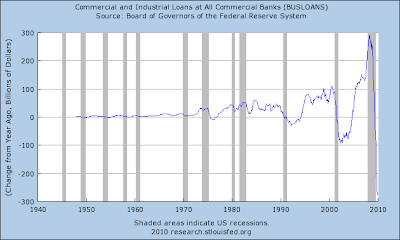 Deflation is the only thing that will make the numbers come down and allow room for more debt cycles. When you erase the deflation with hot money, the real economy still suffers twice as bad because the debt is still there yet the price of things continues to rise making the exponential math worse. We let the central bankers screw with and manipulate what could be a terrific time in world history. Just look at the technological advancements in the past few decades. 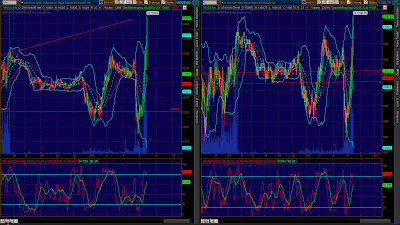 As I’m typing the markets are doing another low volume opening ramp job. I lost faith in the markets a long time ago, they are no longer performing their function of price discovery. No, when the bond market is underpinned directly by government intervention and when the word’s largest banks are allowed free reign with hot money to use quant computers with shadow trades while the government cheers them on, the markets are not right. Don’t tell me the markets are never wrong, the markets have been taken over. It’s a very tragic thing to watch if you understand how this is happening and the long term effects that you know are going to occur. The markets are very overbought in the short term. The rise in prices over the past few days has come on progressively smaller volumes. 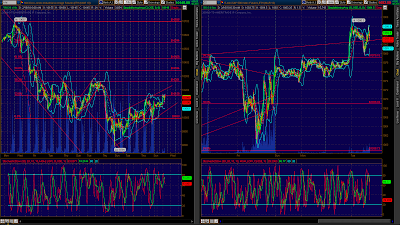 The market is absolutely being propped up on these low volume ramp jobs. Yesterday was the best fit for a turn date, but options expiration is Friday. There is a wave 3 waiting in the wings. No, I don't think the computers can stop it once it comes and in the real world may only serve to make it more violent. Of course hammers have to be validated by today’s action. And here’s a snapshot of the opening spike. Yeah, that’s natural, just mom and pop buying the market with their 401k’s. 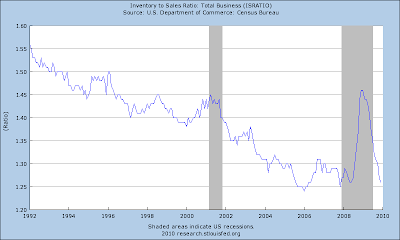 I think this Inventory to Sales ratio chart is interesting. 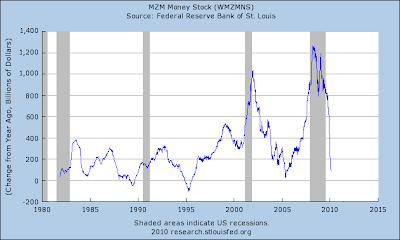 Compare the 2000 – 2002 recession to this one. Note that inventory to sales has been overall coming down, meaning less inventory per sales level which means more efficient, right? But then at the beginning of recession, inventories build, sales slow, and the ratio climbs until businesses correct and let the inventory adjust downward. But I may ask the question, are we seeing efficiency, or are we seeing a DEBT related phenomena where companies cannot AFFORD to carry more inventory? Looks efficient, but then again, I’m sure a business selling off inventory just before filing bankruptcy would produce good looking ratios in this arena too? Hmmm. Yves Lamoureux - The Amazing Shrinking Put/Call Ratio! Yves was kind enough to share some more of his fine work. Here he is seeing the compression of the put/call ratio. As this ratio heads lower, it tends to show complacency and often marks tops - not a perfect correlation, but that is the trend. As it heads higher it shows fear and often marks bottoms. Just look on his chart how the turning points tend to line up with turns. 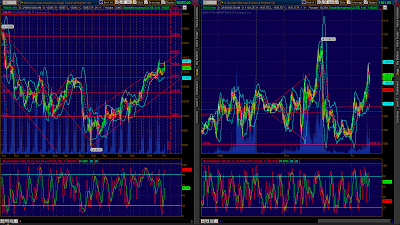 This is compressing, meaning that we have been getting further from the standard in the complacent direction. Can it mean that it will take a proportionately stronger move in equities to get it back into historic ranges? Hmmm… just another clue, and Yves, as usual, is sniffing them out! The Amazing Shrinking Put/Call Ratio! Have you noticed lately the behaviour of the put/call ratio? Once you read the next few lines, you will agree with us that it is a rare event. We have tracked this interesting behaviour since 2007. It is a compression event taking place in the ratio. 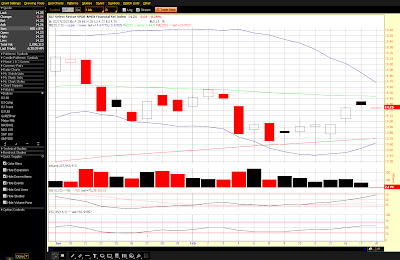 You will notice it from a quick glance at our chart. The put/call ratio is usually defined between a mathematical range. The best example is provided at the left of the graph. 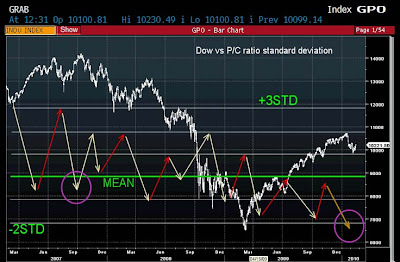 The ratio will bounce around from the mean to +3 standard deviation on a sudden drop of the Dow Jones, taking it to under 13,000. That would be normal behaviour. In our present circumstances, something very different is happening. The Dow started a downward trend in 2008. Sentiment is responding in a very different manner this time. With each successive drop, negative sentiment will rise less. The red arrows provide evidence of the high that was reached. From drops in the stock market beginning in early 2008, the P/C would only get to +2 standard deviation. The phenomenon continues as the ratio gets progressively compressed. Movements in stocks toward the fall of 2008 got to + 1 standard at best. I find the behaviour of this ratio in 2009 extremely interesting. The market’s rally provides further reduction in the swings. The P/C ratio fluctuates in an even more dramatically lower range. You will find the drifting between -2 standard deviation and the mean. Remember that the recent high in January 2010 reflects a higher level of comfort, circled in purple, than investors felt at the 14,000 peak established in 2007. The opinions contained in this report are those of the author and are not necessarily those of Macquarie Private Wealth Inc (MPW). Every effort has been made to ensure that the contents of this document have been compiled or derived from sources believed to be reliable and contains information and opinions which are accurate and complete. However, neither the author nor MPW makes any representation or warranty, expressed or implied, in respect thereof, or takes any responsibility for any errors or omissions which may be contained herein or accepts any liability whatsoever for any loss arising from any use of or reliance on this report or its contents. No entity within the Macquarie Group of Companies is registered as a bank or an authorized foreign bank in Canada under the Bank Act, S.C. 1991, c. 46 and no entity within the Macquarie Group of Companies is regulated in Canada as a financial institution, bank holding company or an insurance holding company. Macquarie Bank Limited ABN 46 008 583 542 (MBL) is a company incorporated in Australia and authorized under the Banking Act 1959 (Australia) to conduct banking business in Australia. MBL is not authorized to conduct business in Canada. No entity within the Macquarie Group of Companies other than MBL is an authorized deposit-taking institution for the purposes of the Banking Act 1959 (Australia), and their obligations do not represent deposits or other liabilities of MBL. MBL does not guarantee or otherwise provide assurance in respect of the obligations of any other Macquarie Group company. Macquarie Private Wealth Inc. is a member of Canadian Investor Protection Fund and IIROC. On the DOW chart, note that the current action has now exceeded the height of the top of the last wave – I’ll get to the wave count later, but while we’re here also look at the formation on the S&P futures, there was a rising wedge and now prices have overthrown the top which is pretty common for rising wedges. The dollar is up strongly overnight and bonds are down strongly after having been higher yesterday. The flow there has been looking strange the past couple of days. Oil made a monster $4 move yesterday and is down slightly today, while gold is about flat overnight. 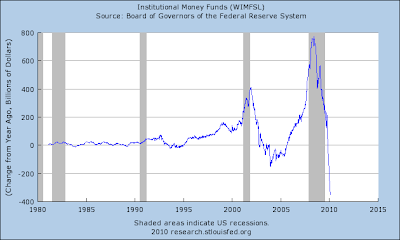 The worthless MBA Purchase Applications index fell 4.0% last week after falling 7% the week prior. Mortgage applications for home purchases fell 4.0 percent in the Feb. 12 week, pulling down the four-week average to minus 1.2 percent. Applications for refinancing fell 1.2 percent with the four-week average up 1.8 percent. The refinance share of mortgage activity is 69.3 percent vs. 69.7 percent in the prior week. Mortgage rates were little changed in the week, averaging 4.94 percent for 30-year loans. Yesterday the Treasury finally admitted they were concerned about coming foreclosures! No kidding? We’ve only been talking about the coming wave of Option-ARM resets for what, the past two years? And yesterday TransUnion reported that mortgages in delinquency rose to the most in history, again, this time rising 10.2% on the quarter and 50% from a year ago! This sent the delinquency rate to nearly 7% of the nation’s loans. TransUnion's quarterly analysis of trends in the mortgage industry found that mortgage loan delinquency (the ratio of borrowers 60 or more days past due) increased for the 12th straight quarter, hitting an all-time national average high of 6.89 percent for the fourth quarter of 2009. This quarter marks the first time the mortgage delinquency rate increase did not decelerate after doing so for three consecutive periods. This statistic, which is traditionally seen as a precursor to foreclosure, increased 10.24 percent from the previous quarter's 6.25 percent average. Year-over-year, mortgage borrower delinquency is up approximately 50 percent (from 4.58 percent). The recovery in housing is cloudy, according to the January starts report. Groundbreaking for new homes rebounded, but permits fell back. Housing starts in January rebounded 2.8 percent after dipping 0.7 percent in December. January's annualized pace of 0.591 million units was above the market forecast for 0.580 million units and was up 21.1 percent on a year-ago basis. Also, December starts were revised up notably from the previous estimate of 0.557 million units. The January comeback was led by a 9.2 percent increase in multifamily starts, following a 12.6 percent jump in December. The single-family component edged up percent after a 3.0 percent decline the prior month. By region, the January boost in starts was led by a 10.0 percent rebound in the Northeast with gains also seen in the West, up 8.9 percent, and the South, up 1.0 percent. Starts in the Midwest slipped 3.2 percent. Housing permits dropped 4.9 percent rise in January, following a 10.9 percent jump in December. The January pace of 0.621 million units annualized is up 16.9 percent on a year-ago basis. Strong seasonal factors and huge shifts in weather make it difficult to find the direction of housing during winter months and this winter is not an exception. Although the latest level for starts is an improvement, the fact that recent gains have been so heavily weighted toward the multifamily component raises some red flags. The multifamily sector has significant vacancy rates and recent advances in starts are likely not sustainable. Single-family increases have been more modest and actually have been about flat on average in recent months-a more rational outcome on the part of homebuilders. The Goldman ICSC store sales figures and the Redbook came out looking as retarded as ever. Is it okay if I use that word to describe incompetent statistical reporting? The Redbook showing a 1.8% gain in store sales year over year (completely not true when stores now out of business are considered), and Goldman flipped from last week showing a year over year gain of 1.8% to now a loss of .7% year over year and a week over week slump of -1.6%. None of their sales numbers are close to reality and now they contradict one another. Industrial production posted another strong gain for January-but this time the strength was real and not weather related. Industrial production in January advanced 0.9 percent, following a 0.7 percent jump in December. The January was marginally better than the market projection for a 0.8 percent gain. The manufacturing component made a robust comeback, jumping 1.0 percent after edging down 0.1 percent the month before. For the latest month, utilities output increased 0.7 percent after spiking 6.3 percent in December on atypically cold weather. Mining output rose 0.7 percent after dipping 0.2 percent in December. Net, industrial production is stronger than the January headline number but also not as healthy as the December headline figure. Lesson-pay more attention to the manufacturing component than to the headline figure. Despite the recent gains in production, the Fed yet has much to worry about bottlenecks in the industrial sector creating any inflation pressures. The overall capacity utilization rate is still low but rose to 72.6 percent from 71.9 percent in December. The latest number matched the market forecast. Import and Export prices are heating up. Definitely surging from the deeply negative price environment that we were in. Import prices, of course, are climbing much faster than export. What does that tell you about what is going to happen to businesses and to consumers? Export prices rose 3.4% yoy, but import prices rose a tremendous 11.5% year over year! That is huge, but it is against very depressed year ago levels very near the bottom in the price of oil. Still, it shows the trend in general and this is a part of the underlying middle-class squeeze and it will be a part of a profit squeeze for businesses who must buy goods and materials from overseas. Inflation isn't a concern right now but import/export prices are definitely heating up, at least at the input level. Import prices jumped 1.4 percent in January, driven by a 4.8 percent surge in the price of petroleum imports but also showing a 0.6 percent rise excluding petroleum. Though increases in the ex-petroleum reading have been steady and stubbornly high, the pressure is centered in raw materials and not in finished goods where capital goods prices, down 0.1 percent, slipped for a second month, and consumer goods prices rose 0.2 percent following no change in both December and November. Year-on-year, import prices for capital goods are down 1.1 percent with consumer goods prices up only 0.1 percent, levels that contrast with the overall year-on-year import price reading of plus 11.5 percent and a petroleum reading of 95.5 percent that's the largest in 10 years. By country, the cost of Chinese goods came down in the month, at minus 0.3 percent for a minus 1.7 percent year-on-year rate. The cost of European goods rose 0.2 percent in the month and jumped 3.6 percent for Canadian goods. Export prices, up 0.8 percent, rose for a third straight month. Agricultural prices show pressure, up 1.4 percent, as do industrial supplies, up 1.9 percent. But there's no pressure for finished goods where export prices rose only 0.2 percent on the capital goods side following a 0.1 percent decline in December and fell 0.3 percent for consumer goods. Today's report doesn't point to trouble for consumer goods prices though it does indicate pressure for producer prices. But producers are absorbing higher input prices, lacking the power to pass through increases given that total demand remains soft. Producer prices will be posted on Thursday with consumer prices out on Friday. FOMC minutes are released at 2 Eastern, as is the Treasury Budget. 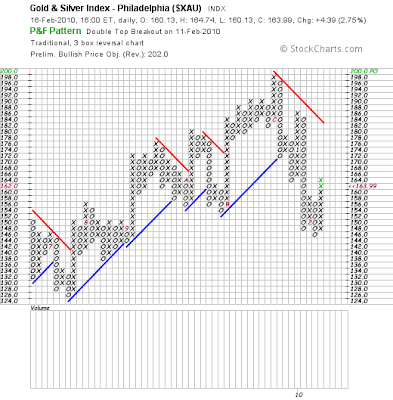 Tomorrow is PPI, Leading Indicators, and the Philly Fed. 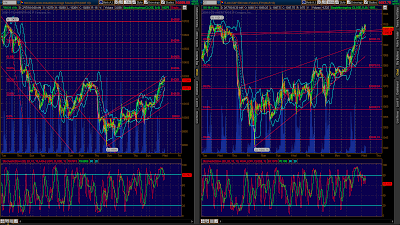 All the indices are overbought on the short term time frames. Keep in mind that this Friday is Options Expirations and so it is a quant having fun type of week, as are almost all weeks nowadays. Today is McHugh’s best fit for a Fibonacci turn date, and there is often a turn in the middle of Opex week, last Thursday was an up day and statistically that means the following week is negative. 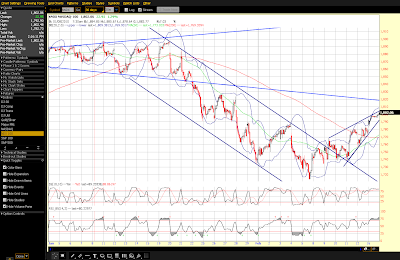 In other words, there is a lot of evidence pointing to the fact that a turn should occur soon in the latest up trend. 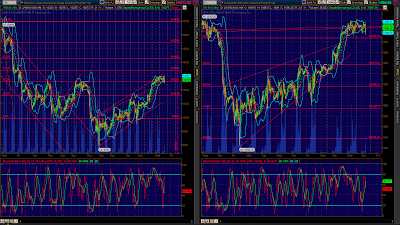 Wave 2s are meant to fool, that’s what they do, and that’s why they are steeper than wave 4s. The psychology is still one where people are saying that the decline was only a correction, see, a new local high, we must be going onto new higher highs. While they’re saying that the market is overbought and starts to roll… We’ll see, I think the direction will be clear shortly. Bee Different – Join the Swarm! AZRainman posted a terrific educational video in the Hive (Swarm Forum). In it, David Logan discusses the 5 types, or stages, of tribes. Yes, you read that correctly, TRIBE. I really like this analogy and believe there are lessons here for all of us who mostly tend to operate in the third stage. I know that I have worked inside of stage two Tribes, LOL, and I think that as a country the United States USED to operate on level 4. This is where creativity spawns innovation and beeing just a little bit different is not such a bad thing! Hey, what country has produced the most patents, the most innovation per capita and in the shortest amount of time? We have a lot to be proud of, but our “mojo” is slipping and we need to break the negative circles that are occurring right now and whose roots are based in a debt backed money system. The point? Please reach out to other tribes and invite them into the Swarm! We can change the world! Speaking of beeing different, Jennifer over at Inside the Hive supports the Swarm concept and sent me the following short video. Yes, for several years now those who have focused in on the debt have felt like we’ve been doing the shirtless economic debt dance on our own. Good to see others catching on, that means that we are getting closer to taking the next step in the evolution of our economy and of our nation. BEE DIFFERENT, Join the SWARM! Interview is from this weekend. While I’m not a big fan, he does bring in an interesting perspective. He is correct in what he sees as far as manipulation in the markets and the way in which the small investor is whipsawed and played. Interesting take on paper gold and how real gold puts a floor underneath it. He sees the fall of Greece as a symbol of the coming fall of the West. He sees a one world currency and the IMF as the head. I see the same thing coming down the pike and this is exactly where we do not want to go and why we must get our plan going before they spring themselves on the rest of us as our “saviors.” They are not our savior, they are the same central bankers who stole our money system from us in the year 1913. Sinclair talks about the big players shorting the debt now of countries just like they did the financial companies. What Jim fails to see, in my opinion, is how and why these entities became debt saturated to begin with. They are not just making money taking them down, they have been making money on the debt on the way up and now also on the way down. There is a way out of this game, support Freedom’s Vision and become a member of the Swarm! But hey, I’m just some guy with a chart, lol. I actually do not like this as a play because of the conflicting direction I see in equities. Did I mention, please register for the SWARM! What follows is a well written article by someone who mostly understands what is transpiring. Not really something you don’t hear from me every day, but the reason I’m putting this up is the quote from the people on what is happening to their lives – the middle-class squeeze writ large. The media has headlined good economic news: fourth quarter GDP growth of 5.7 percent ("the recession is over"), Jan. retail sales up, productivity up in 4th quarter, the dollar is gaining strength. Is any of it true? What does it mean? The 5.7 percent growth figure is a guesstimate made in advance of the release of the U.S. trade deficit statistic. It assumed that the U.S. trade deficit would show an improvement. When the trade deficit was released a few days later, it showed a deterioration, knocking the 5.7 percent growth figure down to 4.6 percent. Much of the remaining GDP growth consists of inventory accumulation. More than a fourth of the reported gain in Jan. retail sales is due to higher gasoline and food prices. Questionable seasonal adjustments account for the rest. Productivity was up, because labor costs fell 4.4 percent in the fourth quarter, the fourth successive decline. Initial claims for jobless benefits rose. Productivity increases that do not translate into wage gains cannot drive the consumer economy. Housing is still under pressure, and commercial real estate is about to become a big problem. The dollar’s gains are not due to inherent strengths. The dollar is gaining because government deficits in Greece and other EU countries are causing the dollar carry trade to unwind. America’s low interest rates made it profitable for investors and speculators to borrow dollars and use them to buy overseas bonds paying higher interest, such as Greek, Spanish and Portuguese bonds denominated in euros. The deficit troubles in these countries have caused investors and speculators to sell the bonds and convert the euros back into dollars in order to pay off their dollar loans. This unwinding temporarily raises the demand for dollars and boosts the dollar’s exchange value. The problems of the American economy are too great to be reached by traditional policies. Large numbers of middle class American jobs have been moved offshore: manufacturing, industrial and professional service jobs. When the jobs are moved offshore, consumer incomes and U.S. GDP go with them. So many jobs have been moved abroad that there has been no growth in U.S. real incomes in the 21st century, except for the incomes of the super rich who collect multi-million dollar bonuses for moving U.S. jobs offshore. Without growth in consumer incomes, the economy can go nowhere. Washington policymakers substituted debt growth for income growth. Instead of growing richer, consumers grew more indebted. Federal Reserve chairman Alan Greenspan accomplished this with his low interest rate policy, which drove up housing prices, producing home equity that consumers could tap and spend by refinancing their homes. Unable to maintain their accustomed living standards with income alone, Americans spent their equity in their homes and ran up credit card debts, maxing out credit cards in anticipation that rising asset prices would cover the debts. When the bubble burst, the debts strangled consumer demand, and the economy died. "Thank you for your continued truthful commentary on the 'New Economy.' My husband and I could be its poster children. Nine years ago when we married, we were both working good paying, secure jobs in the semiconductor manufacturing sector. Our combined income topped $100,000 a year. We were living the dream. Then the nightmare began. I lost my job in the great tech bubble of 2003, and decided to leave the labor force to care for our infant son. Fine, we tightened the belt. Then we started getting squeezed. Expenses rose, we downsized, yet my husband's job stagnated. After several years of no pay raises, he finally lost his job a year and a half ago. But he didn't just lose a job, he lost a career. The semiconductor industry is virtually gone here in Arizona. Three months later, my husband, with a technical degree and 20-plus years of solid work experience, received one job offer for an entry level corrections officer. He had to take it, at an almost 40 percent reduction in pay. Bankruptcy followed when our savings were depleted. We lost our house, a car, and any assets we had left. His salary last year, less than $40,000, to support a family of four. A year and a half later, we are still struggling to get by. I can't find a job that would cover the cost of daycare. We are stuck. Every jump in gas and food prices hits us hard. Without help from my family, we wouldn't have made it. So, I could tell you just how that 'New Economy' has worked for us, but I'd really rather not use that kind of language." Policymakers who are banking on stimulus programs are thinking in terms of an economy that no longer exists. Post-war U.S. recessions and recoveries followed Federal Reserve policy. When the economy heated up and inflation became a problem, the Federal Reserve would raise interest rates and reduce the growth of money and credit. Sales would fall. Inventories would build up. Companies would lay off workers. Inflation cooled, and unemployment became the problem. 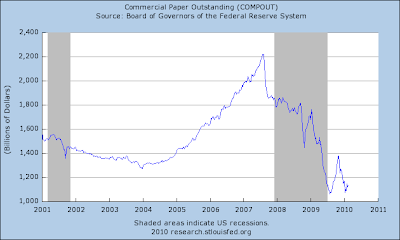 Then the Federal Reserve would reverse course. Interest rates would fall, and money and credit would expand. As the jobs were still there, the work force would be called back, and the process would continue. It is a different situation today. Layoffs result from the jobs being moved offshore and from corporations replacing their domestic work forces with foreigners brought in on H-1B, L-1 and other work visas. The U.S. labor force is being separated from the incomes associated with the goods and services that it consumes. With the rise of offshoring, layoffs are not only due to restrictive monetary policy and inventory buildup. They are also the result of the substitution of cheaper foreign labor for U.S. labor by American corporations. Americans cannot be called back to work to jobs that have been moved abroad. In the New Economy, layoffs can continue despite low interest rates and government stimulus programs. To the extent that monetary and fiscal policy can stimulate U.S. consumer demand, much of the demand flows to the goods and services that are produced offshore for U.S. markets. China, for example, benefits from the stimulation of U.S. consumer demand. The rise in China’s GDP is financed by a rise in the U.S. public debt burden. Another barrier to the success of stimulus programs is the high debt levels of Americans. The banks are being criticized for a failure to lend, but much of the problem is that there are no consumers to whom to lend. Most Americans already have more debt than they can handle. Hapless Americans, unrepresented and betrayed, are in store for a greater crisis to come. President Bush’s war deficits were financed by America’s trade deficit. China, Japan, and OPEC, with whom the U.S. runs trade deficits, used their trade surpluses to purchase U.S. Treasury debt, thus financing the U.S. government budget deficit. The problem now is that the U.S. budget deficits have suddenly grown immensely from wars, bankster bailouts, jobs stimulus programs, and lower tax revenues as a result of the serious recession. Budget deficits are now three times the size of the trade deficit. Thus, the surpluses of China, Japan, and OPEC are insufficient to take the newly issued U.S. government debt off the market. If the Treasury’s bonds can’t be sold to investors, pension funds, banks, and foreign governments, the Federal Reserve will have to purchase them by creating new money. 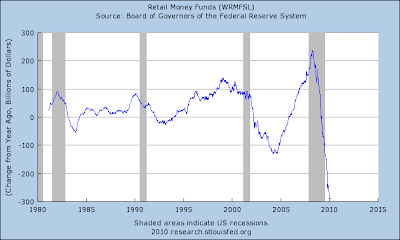 When the rest of the world realizes the inflationary implications, the US dollar will lose its reserve currency role. When that happens Americans will experience a large economic shock as their living standards take another big hit. America is on its way to becoming a country of serfs ruled by oligarchs. Paul Craig Roberts was Assistant Secretary of the Treasury during President Reagan’s first term. He was Associate Editor of the Wall Street Journal. He has held numerous academic appointments, including the William E. Simon Chair, Center for Strategic and International Studies, Georgetown University, and Senior Research Fellow, Hoover Institution, Stanford University. He was awarded the Legion of Honor by French President Francois Mitterrand. He is the author of Supply-Side Revolution : An Insider's Account of Policymaking in Washington; Alienation and the Soviet Economy and Meltdown: Inside the Soviet Economy, and is the co-author with Lawrence M. Stratton of The Tyranny of Good Intentions : How Prosecutors and Bureaucrats Are Trampling the Constitution in the Name of Justice. The first indication on the manufacturing sector for February is very positive as the Empire State general business conditions index jumped nearly 9 points to 24.91 -- a reading that indicates substantial month-to-month acceleration in the region's manufacturing conditions. New orders, at 8.78, and shipments, at 15.14, are both solidly over the break-even zero level to indicate month-to-month expansion. Both readings show less month-to-month acceleration than in January but January's readings were unusually strong relative to December. Inventories came in at zero to indicate no change from January to end a long deep run of negative readings in what is a significant turn for the sample. Restocking hasn't begun yet but the reading indicates an end to destocking. The end of the inventory correction is helping employment which posted a positive reading for a second month, at 5.56 to indicate month-to-month expansion in the region's factory payrolls. Month-to-month increases in shipments are drawing down available capacity, evidenced by a second month of increase in the workweek, at 8.33. The general improvement is evidenced in prices where prices received also rose for a second month, to 4.17. The reading is only a little above zero but it hints at pricing power for finished goods. Prices paid, at 31.94, continues to show significant month-to-month pressure reflecting rising prices for raw materials likely centered in energy products. Readings on the six-month outlook are also solid showing special strength in expectations for both prices and employment. Commodities popped slightly higher following today's report with limited reaction, at least initially, in the stock market. The Philadelphia Fed's regional manufacturing survey, which last month tracked closely with this report, will be posted on Thursday. This is exactly what I dislike about Indexes, and in particular ones that are based on subjective surveys. If you look at that chart you would conclude that manufacturing is back at the same level it was in ’07, and that is not the case in reality, not even close. In fact, capacity utilization is down near 70%, these are all time record low readings, barely up off the recent lows. Some people use this as a leading indicator, and it maybe somewhat, I tend to look at it as a business sentiment indicator more than a true measurement of what is actually being produced. Later in the week will bring inflation data, the Philly Fed Survey, Housing Starts, and “Leading” Indicators. Feb. 16 (Bloomberg) -- European finance ministers turned up the pressure on Greece to put its public finances in order, and refused to say how they would make good on a promise to rescue the nation if it can’t tame its debt. The ministers from the 16 nations that use the euro told Greek authorities yesterday to ready more deficit measures for next month, in case the government fails to show sufficient progress reining in the region’s largest budget deficit. After leaders promised to back Greece last week, EU governments are looking for guarantees that Greece can slash spending before they spell out what help they may offer. No, no, “We certainly won’t let them off the hook,” because that would be a “moral hazard.” They need to cut back on spending forcing their economy to suffer, afterall, that's the right thing to do for debtors, right? When current income cannot service debt, there are very few options. Defaulting on the debt clears it and allows room for another cycle. 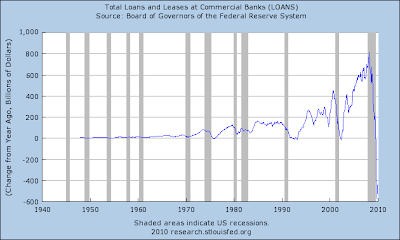 Taking a “bailout” in the form of more loans is the most ridiculous notion and event that could ever transpire. That would be like giving someone who has too much credit card debt more credit cards so that they can continue to borrow from the right hand to give to the left. 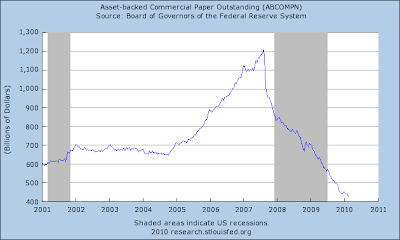 Thus they are caught in the central bankers' circle of debt. That’s what happens when your money is based in and created by debt. Now, another option is for other countries to come in and “guarantee” some of their debt. Does that really solve anything? Of course not, all it does is transfer the default that's coming onto another party. Many are calling for the IMF to come in and “rescue” the situation. This is laughable. The IMF and the central bankers they represent are the CAUSE of the situation! They are the world’s pushers of debt, they print money for nothing, loan it to desperate people in desperate situations of their own debt backed money making, and take gold as payment in return! LOL, that’s how they became the world’s third largest holder of gold! Insane. But here in the U.S., no revolt yet, why here’s a nice picture of a happy business man. Why is he smiling? Is it because business is booming? No, no, it’s because he scored a big fat whopping tax refund! NEW YORK (CNNMoney.com) -- Sick of sending big checks to the IRS? For some business owners, this tax season will bring a rare reversal: A stimulus-fueled tax change is putting cash back into the pockets of qualifying entrepreneurs. Bill Hewitt, who owns several real estate ventures in Denver, recently collected a $150,000 refund check from the IRS thanks to the new tax rules. "Without that money, I probably would have gone under," he says. "When you can't get any loans from anybody, it kept me alive." Hewitt took advantage of a tax maneuver called "loss carryback." When a business books a profit, it pays income tax on its earnings. But if the business then turns a loss in later years, tax rules allow the business to "carry back" its loss and deduct the money from earlier profits. By filing an amended tax return for the earlier, profitable year, the business can claim an immediate refund on the taxes it paid. IRS rules usually let companies carry back a loss into the prior two years. That means a business with a loss in 2009 could go back and amend its 2007 taxes, but any profits from 2006 or 2005 would be untouchable. But last year's Recovery Act extended the window for small companies, allowing businesses with average annual sales of $15 million or less -- like Hewitt's -- to carry their 2008 losses back five years. In November, Congress expanded the tax break even further, allowing businesses of all sizes to carry their 2008 and 2009 losses back for five years. Yes, giving back tax money or lowering taxes under the right circumstances would be a good thing. There’s only one problem in doing so at this stage, and that is that our Federal Tax revenues are crashing while our Federal expenditures have gone ballistic making for an impossible math situation all the way around. What is needed is to break the cycle, the only way to do that is to clear out the debt that permeates consumers, businesses, and government. But when money comes into existence as debt, you are doomed to simply repeat the cycle anew, even if the debt is cleared. I’m pretty sure that unless something major occurs that he won’t be smiling so large over the next couple of years. The technical landscape in the markets is still the same. Friday was a small change in the McClelland Oscillator so today’s move should be large. 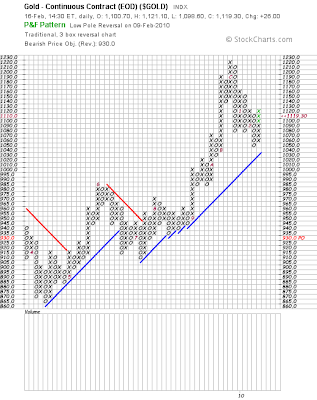 Prices are still trapped in the 1,080 area underneath the 1,090 pivot. McHugh has a turn date this week and believes it will be the top of wave 2 and that next will come wave 3 down. That’s what I’m working from, I think we have interesting times dead ahead, and I don’t think the excitement in Europe is anywhere near over. 1. We will enthusiastically welcome all new Swarm members regardless of their other affiliations, their race, or their other personal beliefs. 2. We will treat others in a civil manner and with the respect that all good American Citizens deserve. 3. While representing ourselves as a member of the Swarm, we will support those who support Freedom’s Vision regardless of their political affiliation. We are free to support and affiliate with any political party. 4. We will be victorious in the fight to restore the money power to the people. This issue is the defining issue of our time and will determine the future path of America for future generations. We refuse to be silent and if anyone expresses doubt about achieving our objective we will speak to them in an uplifting manner. No matter how long or how hard the path may be, our cause is just and it is We the People who hold control of our own destiny. Enact monetary and political reform capable of transitioning our economy from its current debt and derivative entangled state to a prosperous & sustainable system that works to keep the quantity of money under control for the very long term. 6. Members of the Swarm pledge to conduct ourselves in a non-violent manner and will not accept nor tolerate anyone advocating violence on behalf of the Swarm. 7. As Swarm participants we are exercising our First Amendment right to Free Speech. Our goal is simply to communicate to our representatives that We, the People are requesting that our elected representatives Repeal the Federal Reserve Act and replace it with the provisions of Freedom’s Vision. We pledge not to allow anyone, no matter their position, to deny any member of the Swarm their right to Free Speech. 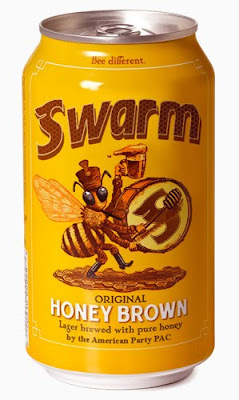 Members of the Swarm see through and reject any attempt to place a derogatory label on any Swarm member. We are not “rebels,” “extremists,” or “conspiracy theorists,” and we are certainly not “Terrorists,” or “anti-American!” We are pro-America, we are AMERICAN CITIZENS who will support politicians who support Freedom’s Vision and we will work to actively remove from office those who oppose it. 8. Members of the Swarm understand and agree that use of “battle terms” or “target” language is not meant in any way, shape, or form a threat against any person’s physical safety or their property! 9. We agree not to attempt to contact elected representatives or other Swarm targets at unlisted personal numbers or locations without invitation. We will not make public any such number or location. Additionally, we agree to keep one another’s contact information such as email addresses and phone numbers private and will not share such information without consent. 10. We agree that the future of the United States is worth 10 minutes of our time per week. We agree to contact at least 10 other people and will ask them to register and participate in the Swarms on behalf of their country and their children’s future. It's time once again, boys & girls, for Uncle Jay to explain... the holidays? Always interesting to listen to Prechter. Pay attention to his discussion of credit… He doesn't understand the history of gold is my only critique.